Diane Carbonell, fellow Blogger and author, has published her first book. I was delighted to interview Diane for this post on Keeping the Pounds Off. 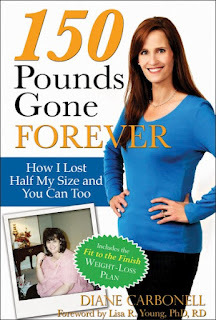 I asked her some questions that were the most intriguing to me in Diane's success at maintaining her weight loss for such a long period of time, through the trials, struggles and bountiful joys of daily life. Basically, I want to know how she stays dry through the humid seasons, the hurricane seasons and the ice and snow seasons. Here are the questions and Diane's complete answers. What thoughts and actions do you employ when things come up and you find yourself wanting to keep eating past your healthy portion? Although this is second nature to me now after 14 years of weight maintenance, when I first began my journey I employed a three step process of "Stop, Evaluate, and Wait" when I felt as though I was not in firm control of my eating choices. I stopped the behavior rather it was serving myself a larger than necessary portion or heading into the pantry for an unplanned snack. Sometimes that stopping process happened mid-fork or mid-step! Next, I evaluated whether the food I was reaching for was within my calorie range for the day, and more importantly rather I was eating from physical hunger or a perceived emotional need. Often times I determined that I was not hungry but rather eating because of stress, boredom, or some other emotion. If I still wasn't sure whether I legitimately wanted to eat the food or have another helping, I made myself wait a bit before eating. Oftentimes I wasn't actually hungry for the food, and was able to stop before I made choices that I would regret later. Whereas many successful maintainers feel they have only been able to maintain while completely restricting themselves from any sugar and flour products, you have been able to still keep both in your life and maintain your weight loss for a very long time. You have already shared with me that that ability did not happen on the first day or even the first couple of years. Can you tell me how you found your way without triggering a collapse back into the food nightmare? This happened solely because I never "dieted" with self-imposed food restrictions. Obviously people who need to eat gluten free because of celiac disease or other conditions do not have that luxury. When I lost weight I decided I wanted to eat like a regular, healthy person and not a "dieting" person. And I did. I cooked regular meals, went out to eat, and enjoyed social occasions with friends. I taught myself how to practice portion control no matter what the food or situation. That way, when I got to my goal weight I did not need to change much of anything. Instead, I just keep eating like I had when I was losing - I just added a bit more food to my day. As far as sugar restriction goes, I believe we all need to watch the amount of refined sugars we consume. Personally though, I find that complete food restriction only works for a very short time. When you become aware that a food has become a trigger for you, do you remove it entirely from your plan or so you bring it back out occasionally and test the waters again? Have you established a boundary where something will remain off you food plan and not be tried again? What brought you to that point? In the beginning, I did restrict chocolate from life for quite some time. I feel like that self-imposed "time out" gave me practice at self-control and also taught me that nothing bad would happen if I did not eat chocolate! Over time I did test the waters by having small amounts. It was a long time before I could buy a bag of Easter candy or Christmas candy and not be tempted to eat the whole thing. I have not completely eliminated any trigger food from my house, although I do not buy them very often. For example, I love those little goldfish crackers, so I rarely purchase them just because I know that I may find myself eating handful after handful of those little guys. Another question: How has your weight loss changed your relationship with your extended family - if any of them are overweight. My relationship with my extended, adoptive family changed after I lost weight, but not due to the weight loss. It changed due to an adoption reunion I experienced. Neither my adoptive family nor my biological family has any weight problems. I started blogging when I was about 11 or 12 years into maintenance, so I really started my blog as a way to reach out to others. However, like anything in life, I get back so much more than I may give! I follow or comment back on about 99.9 percent of people who visit my blog. Everyone needs support. But I do not say "good job" when I see someone losing weight in an unhealthy way. I always try to be honest, encouraging, and offer constructive tips. I've even gotten to know people who are losing weight after lap-band surgery. That is a different weight loss experience, but still involves a lot of the same emotions and careful food choices. Next week: Keeping the Pounds Off review of Diane's book 150 Pounds Gone Forever. Do these questions or the answers make you think about your own quest to have your pounds gone forever? How can using this information help you in keeping the pounds off? Great interview Jane, I loved your questions to Diane. I also feel that when I totally restrict myself from certain foods, I obsess about them then. I obsess about the fact that I can't have them, and what about a little, etc, and it is just a mental nightmare. I have found that I do well with weight loss (and not losing my mind in the process!) sticking to a sensible low carb diet. However, for example, I will have a small spoonful (when my husband or son has a bowl) of ice cream, and it seems more satisfying then, and it's enough, I may think that I'd like to have more, but I'm content and don't seem to feel that internal pressure to have more more more! There are other foods, that I feel are 'off limits' for now anyway. Bread, pasta, candy bars, cereal, and others. Those I can go off the rails with quickly and not even realize what happened! Though, I don't even know if I am interested in incorporating those foods back into my 'plan' at all, I think of those foods as unhealthy for ME. I am curious, Jane, are you influenced by her words, does it make you feel like you can try incorporating some of the 'trigger' foods of yours back into your diet? Would you ever? I have toyed with the premise of 'will eating this food now, make me want more later, or cause a binge?'. I feel that eating certain foods make my body want MORE, and can truly cloud judgement when on a 'carb high', but never have I felt, when bingeing that it was something I SHOULD be doing, that it was a GOOD thing to do. So my common sense brain was front and center through the haze, and I just didn't want to listen! I loved the questions about trigger foods, I find restricting myself doesn't work for me, but that if its something i am going to go crazy with I don't buy it and have it in house, so if really want it, i go to shop and buy one of it. More power to her. I'll never understand what it's like to be a normie. I've been on the diet-go-round many times before. The only thing that is different this time is that I've finally accepted that I am a hopeless sugar addict and compulsive overeater, and that one bite of a sugar food will kill me. It's so liberating not to have to negotiate with trigger foods anymore. Breaking abstinence doesn't mean I'm "cheating" on my diet, it means I'm breaking my agreement with God, that he'll heal my spiritual malady as long as I do the footwork. Through the Grace of God, I've been abstinent since October, and I've turned 80 pounds over to His care since last April. Great post! I agree with the point you made about how to recognize when you've had enough of a portion. One thing I’ve found to be extremely helpful and useful as a supplement to my current diet/exercise plan is Fullbar (www.fullbar.com). Their gummies and bars help curve my hunger, help me with portion control and keep me from consuming more calories than I really need. i think by restricting some food like bread,pasta,sugar etc you can prevent fats. if you want to lose weight then you can keep track of calories you eat and then take care of your food.